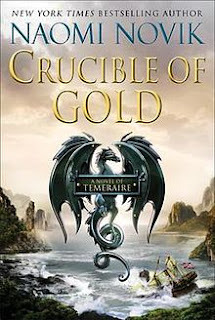 This installment in one of my favorite fantasy series finds the dragon Temeraire and his human companion Lawrence stranded among Incan islands in South America. Since the Incans are considering an alliance with Napoleon, this proves...problematic. However, courtesy of their unyielding moral compass, Temeraire and Lawrence frame this as an opportunity, to perhaps sway the Incans away from a French alliance. I love the growing cast of dragon characters and that the dragons have an equal role in the story as the humans. In fact, one of my other favorite aspects is how the different settings of each book explore the difference in dragon treatment based on each culture. Some revere the dragons like gods while others control them like slaves. I will never tire of the dragon banter, both amongst themselves and with the humans. Temeraire is a lovable blend of majestic and juvenile. His petty squabbles with Iskierka, usually over who has the most treasure or is best looking out for their human, never cease to amuse me. Temeraire can be equally worked up that Lawrence’s jacket is in tatters as he is regarding political debates. Novik has brought decorum to dragons, crafting a unique interpretation of these vain, materialistic, noble creatures. This is one of those series I hope will never end, although I believe it already has and that I only have two books left before the end. Oh, well. Temeraire will live on in my heart long after I finish the last word.